With great economic difficulties at hand and help from the developed West unlikely, Moscow might as well start thinking of itself as an object of action on behalf of Southeast Asian countries. 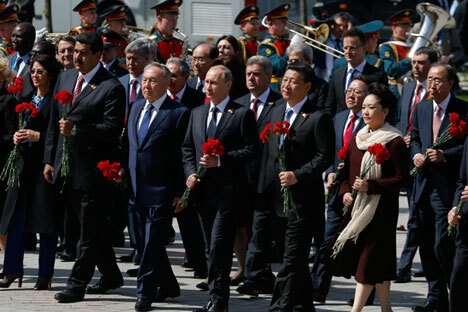 When Moscow was celebrating the 70th Anniversary of Victory in the Great Patriotic War in early May, it was the pompous military parade and Xi Jinping’s visit that attracted all the attention of global media. Those following Southeast Asian affairs also noticed that Vietnamese President Truong Tan Sang was also attending the festivities, reaffirming the traditional friendship and strategic partnership between Russia and Vietnam. But what went almost completely under the radar was the singing of a set of legal documents that would facilitate the establishment of a Vietnamese industrial cluster in the Moscow region. The deal was sealed by the Governor of Moscow Region Andrei Vorobiev and his Ho Chi Minh City counterpart Le Hoang Quan in the presence of the Vietnamese President Sang. The signatory parties hope that over the next few years, firms from Vietnam will be investing in the production of garments, seafood and furniture in the designated area with the regional administration providing land, infrastructure, business stimuli and labor migration quotas. The news came not long after another Vietnamese company, TH True Milk, announced a $1 billion investment project that would see the establishment of a dairy production plant along with cattle breeding facilities in the vicinity of Moscow. The capital flow would be accompanied by Japanese and Australian agricultural technology, a valuable asset for Moscow, given the narrowing scope of cooperation with the West. The two ventures will add to the existing Vietnamese investment in Russia, which includes hydrocarbon exploration and extraction in the Nenets Autonomous region and Orenburg region. And it’s not just Vietnam we are talking about. Firms from Thailand have been active players on the Russian agricultural market, with CPF Ltd planning to invest up to $1 billon in pork production near Moscow, Kaluga and Kaliningrad. The figures quoted above are certainly not yet indicative of a booming Southeast Asian presence on the Russian market. But these examples do demonstrate an important trend. The roles of Russia and its ASEAN partners are not what they used to be or at least not what we perceived them to be. When thinking about these relations we usually use a mindset where Russian policy towards the countries of Southeast Asia is in focus. We seek the reasons for underdeveloped ties in the fallacies of official Russian external action. Well, it seems that this has to change.